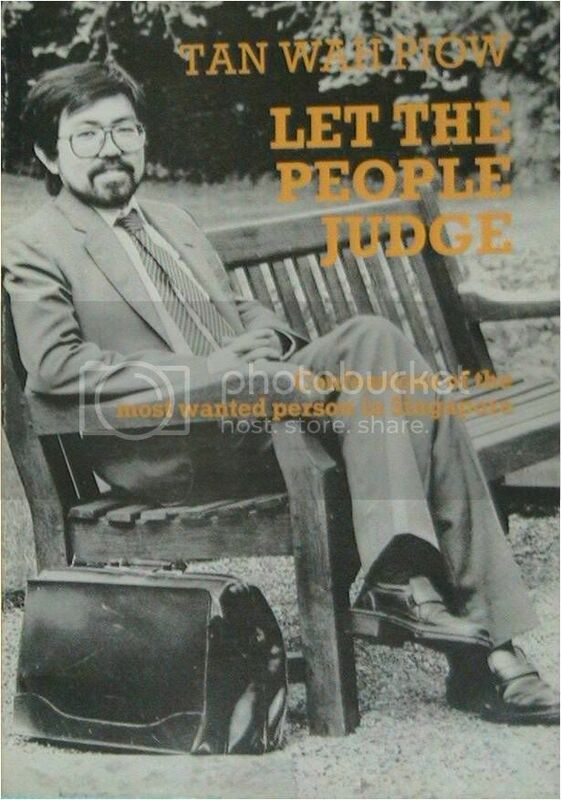 On 10 June 1987, Mr Tan Wah Piow released a book, which few Singaporeans would have known or know about. The publication was a response to the Singapore government’s arrest and detention of a group of 16 Singaporeans about three weeks earlier that same year on 21 May. 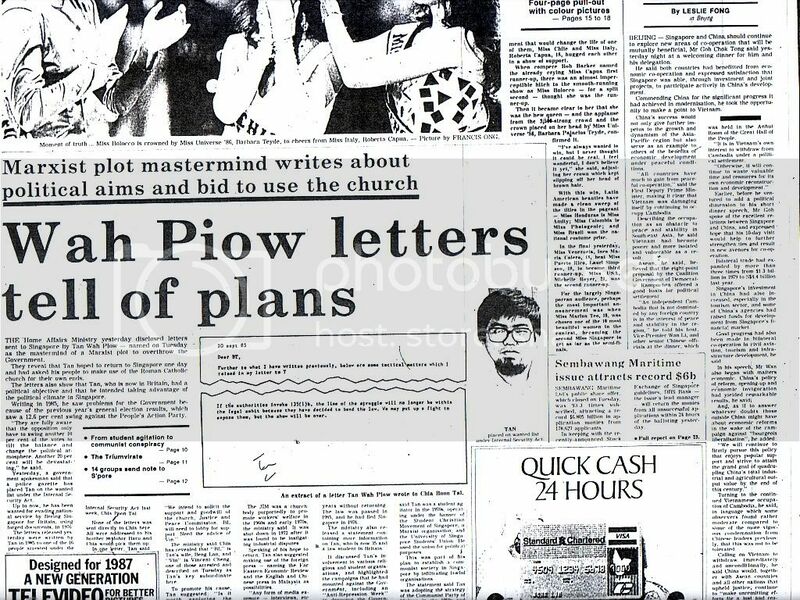 In the book, Mr Tan, who was accused of being the mastermind to the 16 in a “Marxist plot” to subvert the social and political system in Singapore and install a communist state, refutes the allegations and evidence presented by the government. He also provides background to some of his activities in the 70s, particularly the period when he was President of the student union at the Singapore University and his arrest and detention in 1975 for “rioting”, a charge he denies to this day. In 1976, he left Singapore and has been exiled since then. His citizenship was also revoked in 1987 – on 21 May, the day the 16 detainees were arrested. The government had amended the Constitution in 1985 to stipulate that anyone who has been away from Singapore for a continuous period of 10 years is liable to have his citizenship revoked. The book also contains the three press statements he released on 28 and 29 May 1987 in response to the arrests of the first batch of 16 detainees. Mr Tan reiterates, several times in the book, that he believes in working towards democratic changes in Singapore – “within the framework of capitalism, through the constitutional process”. The activities they were involved in, Mr Tan explains, had to do with “issues of democracy and the rights and dignity of the common people in Singapore since the 1970s.” He explains that he had called for intellectuals to be more critical of the way things are “managed” and to work towards the “democratization of the country”. This is because intellectuals “are in the best position to explore new ideas”. Mr Tan then turns to the other charges the government leveled at him. One of these is the accusation that he was involved in a “rioting” incident in 1975. Mr Tan denies this and alleges that there was a ‘frame-up”. The incident took place at the Pioneer Industries Employees Union (PIEU) headquarters in the Jurong Industrial Estate. In his book, he recounts the events leading up to his arrest. He, along with some workers from the American Marine company and students, were supposed to meet with the secretary general of the PIEU for the second time in a week. On the day of the meeting, however, Mr Tan says that the secretary general was nowhere to be found. “Ten days prior to my arrest, I had severely criticized him at an open-air meeting where he and retrenched American Marine workers and university students were present,” Mr Tan explains. He alleges that it was “union officers” themselves who smashed up their own premises at the PIEU and says that at the time of the incident, he was instead seen outside the PIEU office by a Straits Times reporter, among others. Mr Tan was incarcerated for one year for the “rioting” incident. “Circumstances surrounding the call-up were most extraordinary and improper,” Mr Tan says of the conscription order served on him in 1976. “The facts are simple. I was conscripted into the army to serve in the artillery unit on the very hour of my release from the one year sentence.” He says that the students at the university were genuinely worried that the government was using the military service as a continuation of the political persecution against him. “I too was worried for my physical well-being since ‘accidents’ can easily happen in the army,” he says. 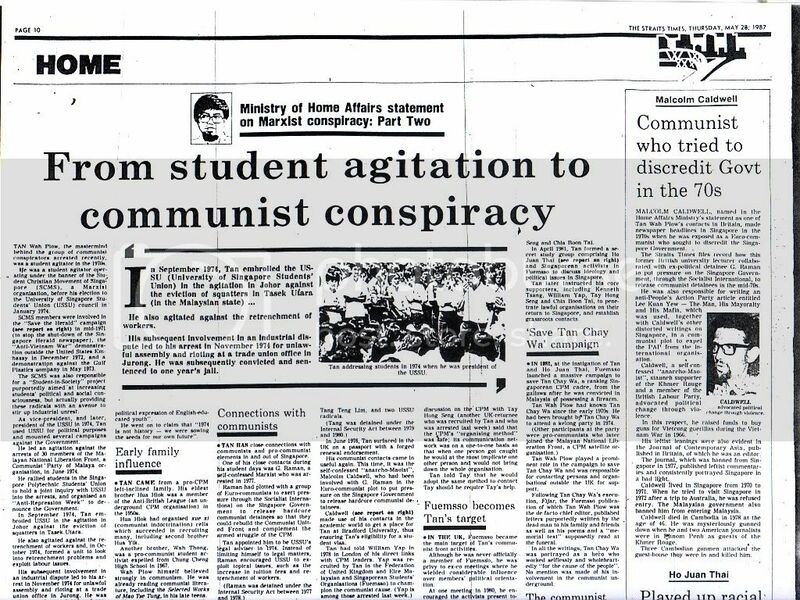 Within days of the “government smear campaign”, as Mr Tan calls it, against him, he issued a press statement to the media, including the Straits Times. He also gave a “long interview” to the Straits Times’ London correspondent. But what appeared in the paper was “no more than five per cent” of his statement, he says. Questioning why his statements were not given the same prominence and publicity in the local media to allow him to defend himself, especially since he was accused of being the mastermind of the plot, Mr Tan says there can be only one answer. He called the accusations a “fabricated” plot by the government to “suppress the truth”. Mr Tan still lives in the United Kingdom. Here is the television interview which Britain’s More4 News programme did with Mr Tan Wah Piow in 2007.